Trim the broccoli and slice any thick stems lengthways. In a small saucepan, melt the butter. Add the bay leaves, lemon zest and nutmeg. Heat gently for 2 minutes, then stir in the lemon juice and remove from the heat. Half-fill a steamer or large saucepan with boiling water. 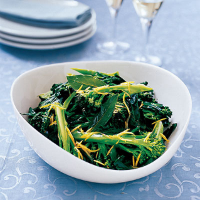 Place the broccoli in the steamer or in a metal colander over the saucepan. Cover and steam for 8-10 minutes until just tender. Transfer to a warmed serving plate. Gently reheat the dressing, discard the bay leaves if desired, then drizzle with the dressing. Prepare the broccoli for steaming a few hours in advance, store in a food bag and make the dressing so that it's all ready for last-minute cooking.